Exodus 15:2 The LORD is my strength and song, and he is become my salvation: he is my God, and I will prepare him a habitation; my father's God, and I will exalt him. 2 Samuel 22:33 God is my strength and power: and he made my way perfect. Psalms 22:19 But be not thou far from me, O LORD: O my strength, haste thee to help me. Psalms 27:1 The LORD is my light and my salvation; whom shall I fear? 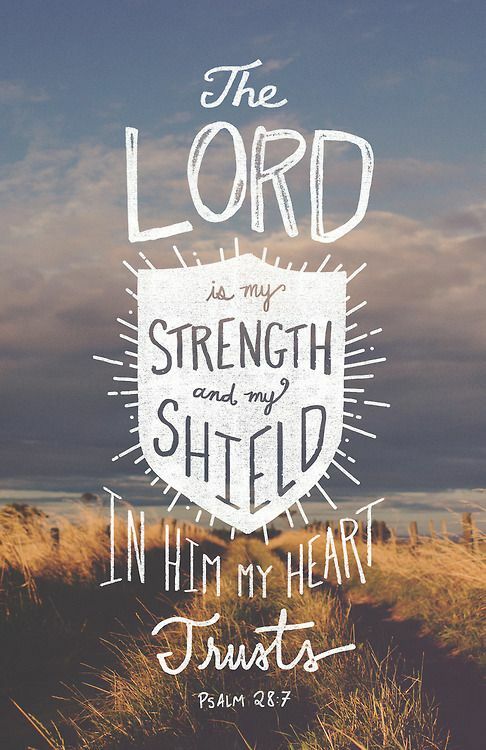 The LORD is the strength of my life; of whom shall I be afraid? Psalms 28:7 The LORD is my strength and my shield; my heart trusted in him, and I am helped: therefore my heart greatly rejoices; and with my song will I praise him. Psalms 28:8 The LORD is their strength, and he is the saving strength of his anointed. Psalms 31:1 In thee, O LORD, do I put my trust; let me be never ashamed: deliver me in thy righteousness. Psalms 31:4 Pull me out of the net that they have laid privily for me: for thou art my strength. Psalms 37:39 But the salvation of the righteous is of the LORD: he is their strength in the time of trouble. Psalms 62:7 In God is my salvation and my glory: the rock of my strength, and my refuge, is in God. Psalms 73:26 My flesh and my heart failed: but God is the strength of my heart, and my portion for ever. Psalms 140:7 O GOD the Lord, the strength of my salvation, thou hast covered my head in the day of battle. 2 My goodness, and my fortress; my high tower, and my deliverer; my shield, and he in whom I trust; who sub due my people under me.